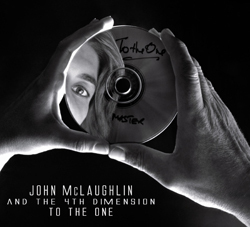 With his new album To The One, iconic guitarist, composer and 2010 Grammy Winner John McLaughlin looks backwards and forwards simultaneously. The six original songs are hauntingly evocative – with roiling rhythmic swells, modal expanses, and telepathic group interaction echoing the profound influence of John Coltrane’s 1965 spiritual jazz masterpiece A Love Supreme. The music of To The One was set down in the studio with very few overdubs, by McLaughlin’s current performing outfit, the Fourth Dimension: Gary Husband (keyboards, drums), Etienne M’Bappe (electric bass), and Mark Mondesir (drums). Compositional devices clearly inspired by Coltrane are fused with elements of McLaughlin’s own multifaceted approach, all delivered with a group empathy and shared vision that harkens back to Coltrane’s fearless mid-‘60s quartet of Elvin Jones, McCoy Tyner, and Jimmy Garrison. The effect of Jones’ kaleidoscopic approach to rhythm and drumming is especially felt, brilliantly recast and explored via McLaughlin’s gift for complex metrical structures.